I know it's not quite the end of the school year yet, but when I get an idea I need to run with it before I get another urgent idea and pretty soon they're all backed up in my mind and invariably one or two may go by the wayside, or at the very least have to wait until next year! 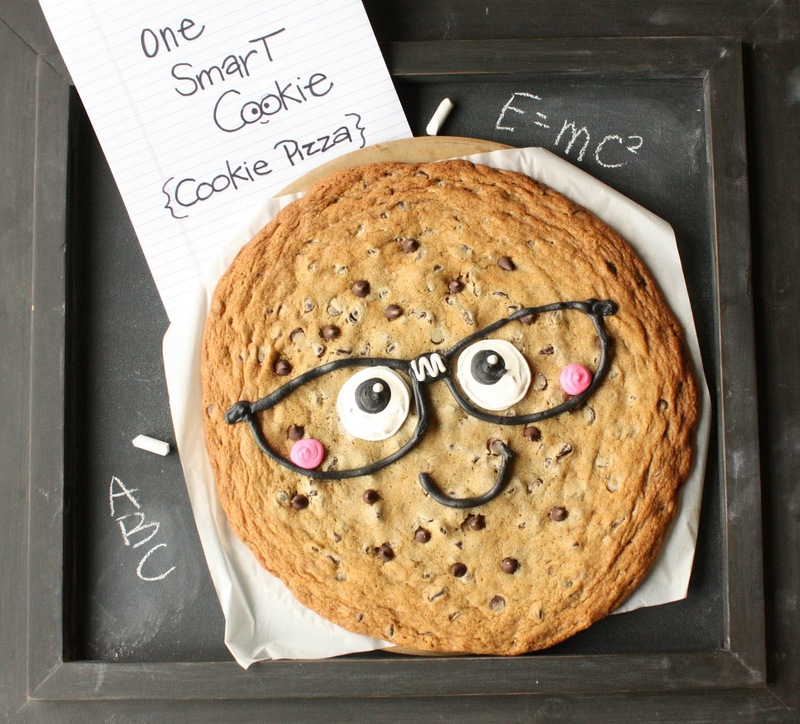 So anyhow, the idea for a "one smart cookie" pizza popped into my head as a fun treat to celebrate the end of the school year for students and/or teachers. I've made some "one smart cookie" sugar cookies, and also a "one smart cookie" cake, but I haven't come across a pizza cookie version and knew it would be simple and fun! Woo hoo! I used the original Nestle's Toll House Chocolate Chip Cookie Recipe found HERE! You can't go wrong with a classic! I used AmeriColor gel food coloring to tint the frosting, black and soft pink. 1. After the dough is mixed put the entire bowl of dough onto a parchment-lined pizza pan. 2. Using a large, offset spatula, spread the dough evenly around the entire pan to within an inch of the edge of the pan. 5. Using a decorating bag and a #5 tip, Outline the eyeglasses and add the smile with black tinted frosting. 6. With a #3 tip, add pink tinted buttercream for the cheeks as shown in the photos. 7. With a #3 tip and untinted frosting, add the white eyeballs and the white "tape" on the bridge of the eyeglasses. 8. Add the black pupils to the eyes and then the white dots with the frosting. My baked cookie was 14-inches in diameter. Serve this cookie pizza to your own kids at the end of the school year, or take a couple to their classroom(s) to share. It would also be a fun teacher gift with a "Thanks for making me one smart cookie" tag attached and placed in a pizza box. Such a cute idea Sur. I'm going to make a few of these to share with my daughters classroom. What a fun and delicious cookie pizza! Thanks, Angie! It was pretty yummy! Such a cute cookie cake. I love how you made the glasses look like they are taped in the middle. That is so fun. Love this as an end-of-year celebration idea. Actually, I think I'd like it any time of the year! 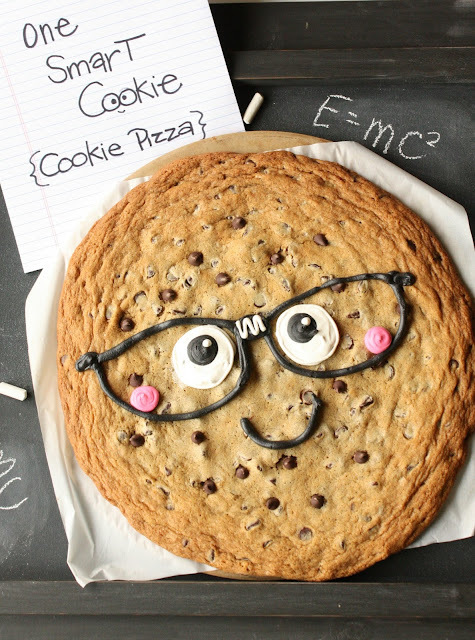 I know one teacher in particular who would love this cookie pizza! I think you are one smart cookie to come up with this idea..love it! This is absolutely adorable! :) Your creations always make me smile. Have a lovely weekend! Thank you, Amy! Enjoy your weekend too! They look fun and lovely! Very cute and very tasty idea!!! This is such a cute idea Sue! Great idea to make a giant cookie and decorate for bts. Easy and quick. I hope it's ok that I've included it in a bts treat round-up with link back.